It’s that time of year again and lots of us are starting to wonder what we can get Granny, Uncle Fred, the girl next door, an unexpected guest or Little Harry for Christmas. I may not be able to help much with Little Harry other than a stocking filler, but these are some of the items I’ve received and appreciated recently. You should find something of interest in this Tin and Thyme Christmas Gift Guide 2016 to suit most adults. When it comes to Christmas chocolate, Divine has it covered. You’ll find something to suit everyone. I’ve written many times about Divine chocolate and the fair trade ethics that it embodies. This chocolate is not only tasty, but it pays a fair wage to the cocoa workers who actually own a significant share of the company. The chocolate is certified by the Fairtrade Foundation and is hand harvested, shade grown and slow fermented for better flavour. Items are available online at Divine and also in Oxfam shops, Waitrose and various independent retailers. Amongst the chocolate goodies on offer, there are chocolate lollies for the kids in both white and milk, a chocolate tasting kit and two limited edition festive chocolate bars. I couldn’t resist breaking into the milk chocolate with spiced cookies ahead of time. What a divine combination indeed and a true taste of Christmas. In line with the Christmas theme, some of the usual West African adinkras imprinted on the chocolate were replaced with suitable festive emblems. I’ll be saving the dark chocolate with cranberries and hazelnuts for my mother; she likes a bit of the dark stuff. £1.20 for a lolly and £2.19 for a 100g bar. The chocolate tasting kit consists of 12 mini bars comprising six different flavours. It comes with tasting notes, information about Divine, including the story of one of the cocoa farmers. This would make an ideal gift for any chocolate lover. £5.50. No Christmas is complete without chocolate coins and for many years my go to coins have been Divine. Not only do they make traditional milk chocolate coins in gold, but they also have dark chocolate ones in red and green – a treat for any vegans or those with a dairy intolerance. This year they are featuring a giant milk chocolate coin, which I’ve rather fallen in love with. What a great stocking filler. All coins are kosher certified. £2 for a large coin or bag of smaller coins. Then there is the advent calendar. I used to get so excited as a child opening the little windows of my calendar each morning, even though chocolate ones hadn’t been invented then. Now they have, my excitement for this old tradition continues, funny that. Divine’s calendar features a colourful nativity scene by illustrator Stephen Waterhouse and includes a winter wonderland snow globe. Each window opens to reveal the Christmas story along with a smooth milk chocolate heart. As if this wasn’t enough, Merry Christmas is also printed in different languages with a corresponding flag. £4. Chocolarder is an artisan Cornish bean-to-bar chocolatier and produces fantastic handmade 70g bars of deliciousness. The cacao beans are sourced directly from the farmers themselves who are paid above market price. This makes it one of the best fair trade arrangements out there. The beans are high quality criolla and are organically grown. The packaging is all recycled or recyclable. The bars themselves are beautifully adorned with cacao pods. Cornish ingredients are used where possible. Chocolarder do a very nice Cornish gorse flavoured bar for example. The Gold Frankincense and Myrrh bar is a Christmas special. The 65% cacao comes from Peru and the bar is decorated with edible gold leaf. The Asháninka is a 70% dark chocolate from the Amazon and has notes of red fruits, sweet apple and hazelnut. As its name implies, the Cornish Honeycomb contains honey from Cornish black bees. It’s a 50% milk chocolate and has notes of honey, toffee and walnut. These would make excellent stocking fillers for the chocolate connoisseur and for the adventurous. You can read my previous post on Chocolarder in this Cornish Cornucopia for a more in-depth review. Available via the online Chocolarder shop and selected Cornish stores. £4.99 for the standard bars and £5.25 for the Gold Frankincense and Myrrh. Just in time for my Christmas Gift Guide 2016, Willie’s Cacao has come up with three new chocolate bars, a dark, a milk and a white. Los Llanos Gold 70 is made with trinitario beans from Colombia and is set to become a classic. This 70% dark chocolate has red fruity notes which quickly give way to a spicer profile. Milk of the Stars 54 is an intense milk chocolate made with 54% cacao from Surabaya in Java. Raspberries and Cream is a white chocolate bar stained pink by raspberries. These give tart bursts of flavour amongst the creamy sweetness. Willie Harcourt-Cooze is another of Britain’s great bean-to-bar chocolatiers and is also based here in the South West. Available to buy in over 20 countries, including Willie’s online shop and at Waitrose here in the UK. £1.90 for the 50g bars and £2.99 for the 80g Los Llanos 70. I was so tempted to break into Willie’s Golden Mini Cacao Pod, but I knew if I did, I wouldn’t be able to prevent myself devouring the contents. Milk chocolate pearls are filled with smooth passion fruit caramel. They sound utter bliss as do the dark chocolate pearls filled with molton sea salt caramel. The pods are golden tins shaped to resemble a cacao pod and would make a great gift in their own right. Cunningly, they have a small ribbon attached so the pod can serve as a bauble on your Christmas tree. £6.59 for the tin +75g of chocolate pearls. More sumptuous chocolate awaits in this delightful box containing four Chocolate and Love bars. The chocolate packaging is particularly gorgeous and features cacao pods aplenty, the inner lining is also biodegradable. Chocolate and Love is a family owned business which also produces Fairtrade certified chocolate that uses premium beans from Panama, Peru and The Dominican Republic. I have tried their bars on several occasions and have reviewed a couple of them. The chocolate is rich and very smooth, even the darkest 100% bar is surprisingly palatable. There are seven different flavours available including coffee, orange, sea salt and caramel and my favourite creamy dark, which is a 55% milk chocolate. Five of the bars are vegan friendly and all are organic as well as being gluten free. Available via Sainsbury’s, Ocado and various independent stores. £2.99 for a 100g bar. Who doesn’t like a bit of personalisation at Christmas? Morse Toad’s Messaging Service allows you to create a telegram printed in chocolate. You can have up to 4 lines with 11 characters on each line. Each letter is an individual block of Belgian milk chocolate. A photo of your choice is included with a personalised printed message on the back. I love it and found the online process incredibly easy. Delivery was next day. I went for a rather conventional message for family that I won’t be seeing this year, but you can say anything you like. £15 including p&p for 22 characters. Morse Toad have kindly offered my readers a 10% discount which is valid until Christmas Day – just type HappyToadmas into the discount box when ordering. In recent years Liskeard has become famous for its fudge. Gingham Chicken has been producing award winning luxury fudge using good Cornish ingredients for over five years now. It’s of the crumbly variety and comes in many different flavours including one of my favourites, Cornish sea salt and pecan. For the festive season, you can buy this limited edition Festive Fudge and I highly recommend it. It has a real taste of Christmas with raisins, cranberries, spices and an indulgent dash of brandy. It’s utterly delicious and you can get it online and at various outlets throughout Cornwall. £5 for a 250g gift box. Hand crafted in Belgium, these marshmallows are big and fluffy. The strawberry & cacao come in a box of six. They are reminiscent of the old neopolitan ice creams with their layers of pink strawberry, white vanilla and chocolate marshmallow. They’d work brilliantly on top of a luxury Christmas hot chocolate. The milk chocolate marshmallows with dark caramel are as delicious as they sound. They come individually wrapped so are ideal to take to work as a lunchtime treat. They can be purchased online at the Barú shop, at Waitrose and various independent retailers. The marshmallows do contain gelatine, so they are not suitable for vegetarians. £2.99 for a 60g pack. Hotel Chocolat is always a good bet for Christmas presents and stocking fillers. I’m a fan of their sleekster boxes that change with the seasons and are the right size to fit through the letterbox if posted. The Classic Christmas Sleekster contains thirty festive chocolates in a red and white box. There is a good mix of types and flavours to suit everyone including Mulled Wine, Mince Pie Brownie, Clementine Baby Bombe, Christmas Mess and Cinnamon Bun. Available either online or in Hotel Chocolate high street stores. £22.50 a box. Back in July, I attended a Christmas in July event at Carluccio’s. There I tasted a number of treats, but the one that stood out was this Venetian panattone with a prosecco flavoured cream filling. It would make a delightful Christmas cake alternative or Boxing Day brunch. Available via Carluccio’s online shop. £19:95 for 900g. Or why not add a 75cl bottle of crisp Santa Sara Prosecco and give a fantastic gift to the prosecco lover in your life for £29.95. Bubbly at Christmas goes without saying and who can resist prosecco? This crisp and fruity Santa Stefano prosecco from Venoto is the one recommended by Carluccio’s and is available from their online shop. £15.75 for a 75cl bottle. Martin Miller is acknowledged as kicking off the gin renaissance here in the UK. This original Martin Miller’s Gin was created to excite a new generation of gin lovers. It’s a premium gin, distilled in England & blended with Icelandic water for Arctic Clarity. It has a soft and smooth mouth feel with well balanced flavours and refreshing citrus notes. Time to mix some cocktails. Available from supermarkets and other retail outlets. Around £25 for a 70cl bottle. This original London dry gin from Greenall’s uses classic botanicals such as juniper, coriander, lemon, almonds and cassia bark. It’s not particularly complex but is smooth and crisp and works best as a mixer for a classic Gin & Tonic. Widely available in supermarkets and other retailers. RRP around £15. Pretty much everyone has a SPAR shop not too far away and they are now well stocked with festive wines for our pleasure and convenience. Spar Wines are enthusiasts and have won a number of awards. You might be surprised at what you can find: bubbly extra dry Prosecco speciale; white French Chablis 2014; red Chateauneuf-du-Pape from Les Trois Couronnes 2014. £9. £11 and £13.50 respectively for a 75c, bottle. 31 Dover is an online drinks specialist. As well as standard bottles of spirits, Champagne, wine and beer, they also have a good collection of miniatures. These cute little bottles always remind me of my grandfather. Our family is a bit nuts about stockings and everyone always gets one, be they child or adult. My grandad always had a miniature placed at the bottom of his stocking and it was his favourite bit. He’d take a quick tipple whilst still in bed and be merry for the rest of the day. To my delight, I was offered a pick and mix miniatures gift box to include my choice of three 5cl bottles. I chose: Rubis chocolate wine – it would be rude not to; The Botanist Scottish dry gin, which is made with 22 foraged botanicals from the Isle of Islay and is said to glide over the tongue in the most delightful way; Casamigos Anejo Tequila is aged for 14 months and has notes of caramel and vanilla – who could resist? £3.95 for the gift box plus £1.75 upwards per bottle depending on what is chosen. For those not wanting to drink alcohol or wanting mixers for their drinks, James White do a great line in fine pressed juices and other drinks. The Big Tom Spiced Tomato Mix is a blend of tomato juice and 22 herbs and spices. Sip chilled all on its own or add ice. Alternatively mix with a shot of vodka, ice and a stick of celery for an intriguing Bloody Mary. The single variety apple juices are made from pressed English apples and make for a great alternative to wine with meals. The Bramley is crisp and dry and goes well with savoury foods. The Russet is a beautiful caramel colour and tastes like it too. It works best as a dessert juice to sip with cheese or pudding. As for Britain’s favourite Cox, this is light and fruity and can be enjoyed with a meal or all on its own. Great Uncle Cornelius’ Famous Spiced Ginger is a non-alchohoic aperitif. Smooth and rich, it can be served hot or cold or even added to whisky for a fiery Ginger Mac. Available via most supermarkets, Majestic Wines or online at James White. £2.25 for 75cl bottle of the Big Tom and apples juices and £3.60 for the Spiced Ginger. For tea lovers and health enthusiasts, a pack of yogi tea in your stocking is not going to go amiss. Yogi teas are organic and only use natural ingredients. Spice up your tea drinking and try something a bit different. There are plenty of flavours to choose from including these: Choco Mint with vanilla, cardamom & black pepper; Ginger Orange with vanilla; Lime Mint; Detox Tea with lemon, bitter dandelion, sweet liquorice and spicy ginger; Liquorice Mint with cinnamon, ginger and cloves. Available via Discount Supplements. £2.39 for a 17 bag box. Apart from chocolate and booze of course, there’s nothing quite like cheese and biscuits for pleasing folk. Give some artisan cheese along with a pack or two of craft biscuits and maybe throw in a pot of homemade chutney and you will bring a smile to many a face. My beetroot chutney is a particularly good one – just saying! Yumbles offer a whole range of artisan natural food and drink products and are well worth checking out for gift ideas. They source the products they offer from over 400 British artisan producers. The two Godminster cheeses featured here are organic and delicious. The vintage cheddar is available as a heart or round and is made with the farm’s milk, as is the brie. The organic cheese selection features a 400g cheddar, a 200g smoked cheddar and a 200g brie. £23.95 including p&P. The seaweed crackers in the form of water biscuits and oatcakes come from Stag Bakeries on the Isle of Lewis. You can read my review in this Food Bites feature, but suffice it to say they make a very fine accompaniment to both cheeses. The biscuits are also a perfect size for canapés. Cheese straws are always useful for Christmas parties and Stag’s gourmet all butter cheese straws with Highland Smoked Dunlop are particularly fine. Available from various retail stores including Lakeland and Marks & Spencer. £2.50 for a box of 30. Other crackers that would go down well for the festivities are Peter’s Yard sourdough crackers. These are award winning authentic Swedish style crisp breads and come in a variety of flavours including pink peppercorn and caraway. Available from Waitrose, Ocado, various independent stores and online at Peter’s Yard. £2.50 for a 90g box. I have used Cornish Sea Salt in my bread ever since I first started making sourdough seven years ago. It wasn’t until recently, however, that I discovered their was more on offer than plain old sea salt. Mini tubs of Pinch Salts™ come in a variety of flavours and are perfect for seasoning all sorts of things. My first discovery was smoked sea salt, which I’ve used to add just a touch of sophisticated smokiness to salted caramel. You can buy gift packs containing three tubs which are ideal for any cook worth their salt! The two shown here are: Salty Essentials with sea salt original, smoked sea salt and sea salt & luxury pepper; Punchy Seasonings with garlic sea salt, onion sea salt and chilli sea salt. £6.20 and £7.25 respectively for a pack of 3 50-75g tubs. For someone who’s short of time, watching their weight or just doesn’t want to cook, a subscription to Huel could be just the thing. Huel is a complete meal in a glass. Shake the powder up with water and bingo, lunch is ready. It contains oats, linseeds, pea and rice proteins along with various other ingredients for optimum nutrition. You can get a sweetened vanilla flavour or add some sweetened cocoa flavouring, but to be honest both CT and I preferred it plain. Indeed we quite like it. It’s not much different from having a normal breakfast smoothie and you can always add fruit or greens to it if you want. Head to their website for more information. £45 for a one off order of 28 meals. No Christmas is complete for me without a new cookbook. I am possibly rather obsessed by cookbooks, but I suspect I’m not the only one. My Christmas has come early this year with four fabulous new titles.
. Like the rest of the British population I took to curries like a duck to water and cook them regularly. Meera Sodha takes a fresh look at traditional vegetarian Indian cuisine and gives us 130 easy, modern and delicious recipes. It’s a book I’m very keen to work my way through. Dishes that have particularly taken my fancy are: smashed Jerusalem artichokes with butter, pepper and garlic; mushroom and walnut samosas: sweet potato kebabs, fennel & apple chaat with caramelised almonds and pumpkin, black eyed bean & coconut curry. I’ve already made the banana and cardamom buns which I will be blogging about at some point. Suffice it to say, they were gorgeous. Published by Fig Tree at £20. , his 3rd book, he takes some of our favourite childhood cakes, patisserie and chocolates and makes them accessible to the home cook: think arctic roll, jammie dodgers and walnut whips. The book is beautifully illustrated by photographer Kevin Summers. I now have all three of his books and they are definitely keepers. You can read my review of William’s second book Pâtisserie by clicking on the link. Published by Jacqui Small at £25. is themed around her favourite ingredients. A is for Almond, B is for Blue Cheese, C is for Caramel and so it goes on. Each chapter opens with an introduction to the ingredient which includes its history, science and storage. The recipes featuring that ingredient then follow. X is for Xmas. Whilst this isn’t an ingredient, it’s a very welcome chapter with recipes for: bread and walnut sauce; candied peel; Brussel sprout, hazelnuts & lemon zest salad. It’s not a vegetarian cookbook, but it’s light on meat and fish and contains some fascinating recipes – marmite and cheese mini doughnuts anyone? I’m very happy to have it in my collection. Published by Fig Tree at £25. , subtitled ancient methods, modern meals, explains how to make the classics such as tempeh and beet kvass and then gives a recipe to use them in. Sourdough toasties with fermented toppings immediately caught my eye. Fermenting is only one part of the book, methods for pickling and drying are also included. Again, this is not a wholly vegetarian book, but the techniques are there for all and many of the recipes are suitable for vegetarians. Published by Frances Lincoln at £20. All cooks need some reliable scales and Salter are known for producing some of the best. This Salter Kitchen Gift Set includes scales, thermometer and timer. I’ve been using all three for a few weeks now and I’m so pleased with them. The scales are really neat. Big enough to put a mixing bowl on, but small and light enough to easily pick up, move around and store in a cupboard or drawer. The scales are digital and have an easy to read LCD display. As you’d expect, you can take the scales back to zero with each ingredient added, which is super handy. It can weigh of to 5K in either metric or imperial units and has an aquatronic function for measuring liquids. The instant read thermometer goes up to 200C and the timer can be set for 100 minutes to count either up or down. All come with batteries and are ready to go. Currently on offer at £24.99. If you’re ever stuck for gifts, I can recommend dotcomgiftshop. As the name suggests, it’s an online gift shop with interesting items, unusual designs and reasonable prices. I particularly like it for its Japanese inspired porcelain. As soon as I saw this Cobult Sunburst Design I knew I had to have some for my Christmas Gift Guide 2016. It’s one of those designs that the longer you look at it, the more complex it becomes. I’m now the proud owner of a salad bowl, blossom bowl and side plate. £14.95, £4.95 and £8.95 respectively. I’m a big fan of Joseph Joseph who are continually coming up with innovative designs to help cooks and bakers at home in the kitchen. One of the latest innovations is Gusto, a flavour-infusing spoon. Just place your herbs or spices in the bowl of the spoon and stir the flavour in to your soups or stews as they cook. Just what we need for all that mulled wine and cider we’ll soon be quaffing. It comes with a nifty herb stripping function at the top of the spoon and would make a nice stocking filler for a keen cook. Available at various retail outlets and online at Joseph Joseph. £6 (although currently reduced online to £4.80). I’m absolutely delighted with the adjustable rolling pin. The wooden pin comes with removable measuring rings at 2, 4, 6 & 10 mm so you can easily roll your dough to the thickness required. It has the added benefit of rolling your pastry or biscuits evenly, something I’m not very good at. I tried the rolling pin out on these giant chocolate macadamia nut cookies and it worked brilliantly. Available at various retail outlets and online at Joseph Joseph. £22 (although currently reduced online to £17.60). I haven’t yet done a review of my new Optimum G2.3 platinum series induction blender, but I have used it quite a bit. These kale pancakes were quite something. It comes with a large jug and a small one for single serve smoothies and smaller amounts. The small jug has a clever rotating lid which easily removes anything gumming up the sides. A curved spatula and sturdy tamper tool complete the kit. Whilst I’m not altogether au fait with the technology, this blender has a brushless motor which makes it less likely to break and significantly quieter than other power blenders. Currently on offer at £399. Free P&P Offer on any Froothie blender – add 2483 free ambassador delivery to the comment box when ordering to get free postage and packing. Delivery will be credited back onto your card. The stationary fanatic in me was thrilled to discover that you could create your own personalised edible cupcake toppers. My Cupcake Toppers offers varying sizes and grades of rice paper as well as toppers made from icing and edible ink. It’s easy to upload your own photos and logos and then write your own messages. I decided it would be fun to have a load of mini rice paper toppers with my logo on as well as some larger ones made of icing. There are also a number of ready made toppers to choose from if you so wish. Prices start at £1.20 for a rice paper sheet of 54 existing designs. Now what fun are these cute and handy little bottles? If you’re a chilli head like me, you really need one of these in your life. Just ready and waiting to fill with your favourite hot sauce, these mini Pocket Sriracha bottles can be clipped to your keys, bag, belt or anywhere else that’s useful. Chilli on the go. A must have stocking filler for the chilli lover in your life. Currently on special offer at £9.95 for a pack of three. OXO is another company that are always coming up with innovative and useful gadgets. CT and I are always squabbling over who should open the wine – we both dislike it. We’re not great wine drinkers, so we’ve never really mastered the knack and something always seems to go wrong. The cork gets stuck as often as not and if it’s not that, the corkscrew breaks. We don’t need to squabble any longer. OXO have come up with an easy to use Vertical Lever Corkscrew which not only does the job, quickly and simply, but comfortably too. The lever is made out of die-cast zinc and has non-slip soft grips. Mostly constructed of OXO steel, the corkscrew is sturdy and durable. It comes with a removable foil cutter and a second non-stick screw, just in case the first one gets over worked. You can tell this corkscrew isn’t going anywhere. Available from most kitchen shops, department stores and online. RRP £45. With the Danish concept of hygge very much on trend this year, candles are a must. These San Miguel scented candles are pressed into a tumbler style glass with an aluminium lid. The glass is recycled and sports a beautiful floral motif. I was sent a Red Berry and a Cinnamon candle to try. The scent is definitely reminiscent of Christmas and helps to give that warm hygge feeling. They are available via ICTC who specialise in cooking, tableware and gifts for the home. £35.70 for a set of six. Please do let me know what you think of my Christmas Gift Guide 2016 and if there’s anything here that catches your eye. Disclosure: I was sent these products for the purposes of my Christmas Gift Guide 2016. I was not asked to write a positive review and as always, all opinions are my own. All but the Carluccio’s, Martin Miller’s, James White, OXO and SPAR pictures are my own. The post contains affiliate links. Buying through a link will not cost you any more, but I will get a small commission. Supporting the brands I work with helps keep Tin and Thyme blithe and blogging. What an amazing list, so many lovely gift ideas! Thanks Kavey. I tried to get all bases covered. Such a great selection! I love the bowls and the book by Felicity Cloake! Thanks Kate. Felicity Cloake’s book is great. It was hard to do it justice in such a short space. My goodness, what a comprehensive gift guide, definitely something for everyone. Hopefully Janice, unless, of course you’re someone who just isn’t in to food or drink! Woweeee! 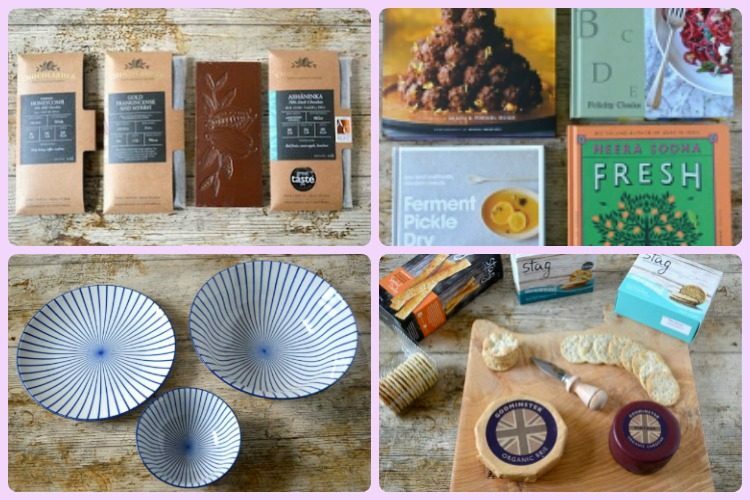 I’m feeling proper festive after reading through your foodie treasures, and now have a few perfect gifts in mind too! Acquiring cookbooks is terrible habit to have Nicky. I love my them all, but my bookshelves are all overflowing! This guide is AMAZING as I always find it hard to get inspiration for presents for my friends and family… but also for myself when people ask what I want. Those dot com giftshop plates are wonderful… such a fan of blue and white pottery! Thanks Jan. I think the pottery is definitely getting the love. Aren’t they just Amy? I’m keen to be gifted some more of these too. Thanks for commenting Jean. That’s a very good point about scented candles. I didn’t know they were an irritant, but I do know they’re not everyone’s cup of tea. CT’s not too keen, but luckily I have a friend who loves them. What a lovely selection of treats, you’ve got some really lovely ideas there for vegetarian foodies. Tempted by all those chocolate brands, and I’ve got both Fresh Indian and Felicity Cloake’s A-Z on my Christmas wishlist now, they both sound right up my street! Thanks Kate. Good chocolate is always tempting and both of those books are keepers. That gin looks interesting, might have to check it out when I’m in Blighty in a couple of weeks’ time. And yes, you’re right about Spar – we even have it here, except it’s called Špar (and InterŠpar if it’s a hypermarket). There’s always a great selection of reasonably-priced wine, plus we get all the domestically-produced booze too! Those 31 Dover miniatures look wonderful; I’ve had the chocolate wine before (and loved it) but those others sound so yum, especially that tequila. I think out of all of them though, I’d go for the candles. I’m such a pushover for Christmas spice-scented candles! I love those bowls, and you’ve reminded me how much I love Big Tom! I must get some more. I want to try the Miller’s gin as well. Great gift guide! Oh what an amazing gift guide. Absolutely epic! So useful and so many things on her that I will be adding to my shopping lists. What an epic gift guide! So many fantastic ideas, but I’m loving the look of that Salter scales set – might have to treat myself with that! Thanks Elizabeth. I’ve used various scales over the years and this one is a particularly good design. I remember Divine chocolates! What a throwback they used to sell these in vending machines at my secondary school. I didn’t know that Ana. You were lucky, that’s a much better option than lots of the chocolate found in vending machines. Wow, so many amazing gift ideas! Hotel Chocolat is my favourite kind of chocolate if I’m honest! They have such a lovely festive range, too! Chocolate and Love sounds like an awesome brand, too! Great post! So many lovely gift ideas. Those bowls are beautiful, I’m sure they’d look good in anyone’s kitchen. The fudge sounds delicious too. I’m totally in love with those bowls Jen and the fudge is totally scrumptious.